CIPP Cured-In-Place Point Repair is a process where a liner is inserted into a pipe impregnated with a thermosetting resin, which is expanded and cured to form a tight-fitting liner within the host pipe, a pipe within a pipe. The CIPP process incorporates the existing pipeline into the finished product to produce improved performance of the original pipeline. Although cure times vary due to host pipe material and temperatures, PipePatch is typically cured in 1 to 3 hours. 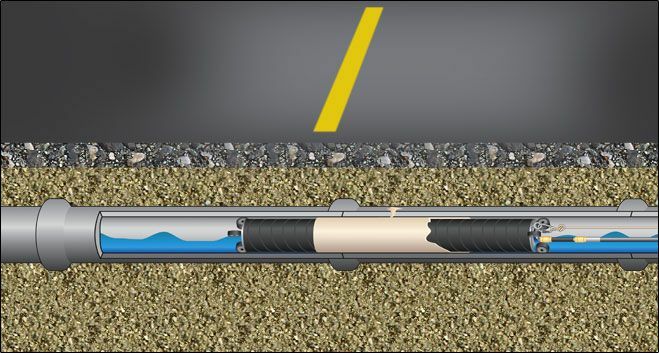 Point Repair is PipePatch’s cost saving process of lining only the areas that require repair versus lining the entire length of pipeline. PipePatch’s point repair system not only saves material costs but also man-hours. Depending on the pipes diameter, PipePatch requires only 1 to 3 technicians to complete a repair.